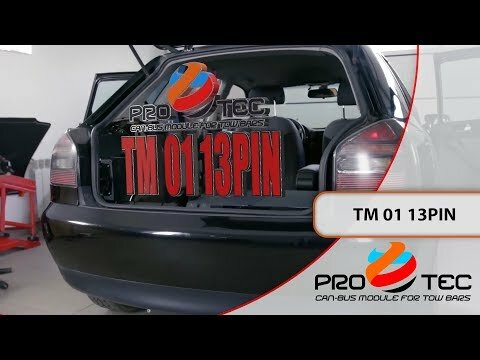 T-CAN car’s towbar electronic module is an unified appliance. It is DIRECTLY connected to a vehicle’s digital data bus. system and the trailer’s electrical system. Electronic Control Unit (main computer). T-CAN module is an INNOVATIVE and RELIABLE appliance. IT ENTIRELY MEETS vehicle manufacturer’s engineering requirements and restrictions. Kits of electrical components for towing hook installation. CAN-BUS electronic module, its function is to connect vehicle’s security alarms together. Electronic module that provides logistics data from CAN-BUS. Indication lights – bulb failure detection system (circuit breaker). Quick installation 7 Pin kit is compatible with modern cars electrical systems (CAN-BUS, rear LED lighting and conventional bulbs) and can be used in trailers with LED lighting. PRO TEC CSS provides low cost modules with various lengths of wiring. Customer has an ability to screw terminations of the wiring to a socket on his own. AntyFog lighting turns on automatically. Compatible with trailer’s LED lighting. Compatible with trailer’s LED and conventional bulbs. Innovative and quick installation device based on electronic control unit. 7 Pin kit – compatible with modern cars electrical systems (CAN-BUS, rear LED lighting and conventional bulbs) and can be used in trailers with LED lighting. Electrically safe for user (equipment prevents: short circuit and overload electrical current). Park assist (PDC) system sensors cut off function. Buzzer informs user about lighting status of the trailer. Power distribution control system. Voltage flows to a power supply socket of the trailer only when trailer is recognized as available, connected (power socket more durable). Quick installation 13 Pin kit is compatible with modern cars electrical systems (CAN-BUS, rear LED lighting and conventional bulbs) and can be used in trailers with LED lighting. Trailer’s power supply wiring harness*. Provides electricity for trailer’s lighting. Provides power supply for a fridge. Trailer’s battery recharging control system. Quick installation kits (7 Pin or 13 Pin) compatible with modern cars electrical systems. These devices convert 24V DC to 12V DC. Kit applicable only for conventional bulb lighting of the trailer. Activated alarming system provides a warning signal, when a trailer is disconnected from a vehicle. Alarm also forwards such information to the Monitoring system. 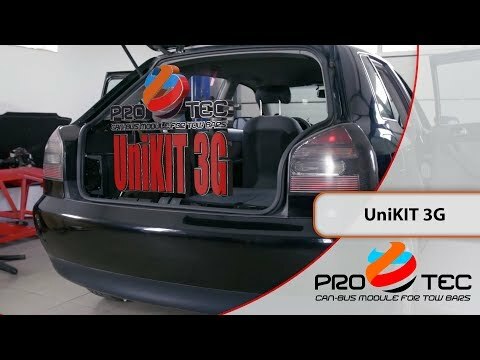 UniKIT module is a complete installation kit for towbar. Kits consist of necessary wiring and 7 pins or 13 pins connector (depending on chosen version). UniKIT module recognizes if the trailer is connected to a vehicle and then it turns off rear PDC sensors of the vehicle. UniKIT operates and it is compatible with modern cars equipped with conventional bulbs lighting or LED lighting system. Indication lamp’s bulb failure turns the buzzer on – in this case, parking lamps take functionality and those lamps become indication lamps, until a proper maintenance activity is done. Otrzymują Państwo tę informację w związku z realizacją przez PRO TEC CAR SECURITY SYSTEM Albert Marczak obowiązku prawnego wynikającego z Rozporządzenia Parlamentu Europejskiego i Rady UE nr 2016/679 z dnia 27 kwietnia 2016 r. w sprawie ochrony osób fizycznych w związku z przetwarzaniem danych osobowych i w sprawie swobodnego przepływu takich danych oraz uchylenia Dyrektywy nr 95/46/WE (określane popularnie jako „RODO”). 13. Jeżeli sądzi Pani/Pan, że przetwarzanie Pani/Pana danych osobowych narusza RODO ma Pani/Pan prawo złożenia skargi do organu nadzorczego, w szczególności w państwie członkowskim swojego zwykłego pobytu, swojego miejsca pracy lub miejsca popełnienia domniemanego naruszenia. Obecnie organem nadzorczym jest GIODO, natomiast od dnia 25 maja 2018 r. pełnienie owej funkcji rozpocznie Prezes Urzędu Ochrony Danych Osobowych (PUODO). dostępu do treści danych oraz ich sprostowania, usunięcia lub ograniczenia przetwarzania, a także prawo sprzeciwu, zażądania zaprzestania i przenoszenia danych, jak również prawo do wniesienia skargi do właściwego organu nadzorczego.